EGIS® is also available in 0.8 mm thickness. 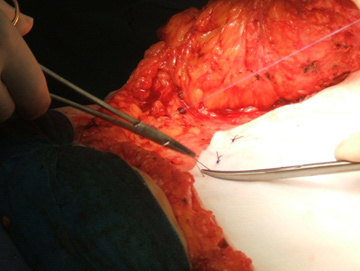 Its softness and malleability makes it easy to use in laparoscopic operations. EGIS® can easily be passed through a trocar and can be fixated withmetallic or resorbable staples using common staplers. Open the box and remove the double sterile packaging. Open the outer container and remove the inner sterile container using aseptic technique. 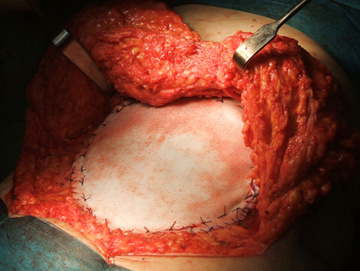 The inner container is sterile and can be placed directly into the sterile surgical area. 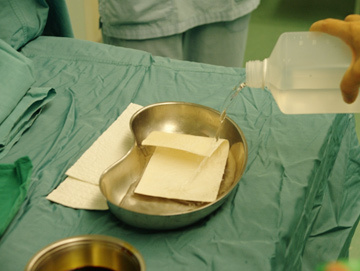 Carefully open the inner foil bag and remove the surgical membrane, following aseptic technique. Always use sterile gloves or forceps when handling the membrane. Place EGIS® into a sterile bowl filled with sterile saline solution, sterile Ringer’s lactate or sterile Ringer’s solution (room temperature) for a minimum of 5 minutes. Make sure that EGIS® is fully covered by saline solution. Keep EGIS® in the sterile solution (at room temperature) until ready to use. The acellular matrix can remain in the sterile solution for a maximum of 4 hours. Prepare the implantation site applying accepted techniques. EGIS® can be folded and or cut.To maximize integration EGIS® should be placed in contact with well vascularized tissue. Insert EGIS® into the implantation site using sterile gloves or sterile forceps. 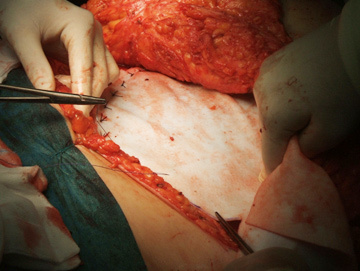 Suture the membrane using interrupted permanent sutures. 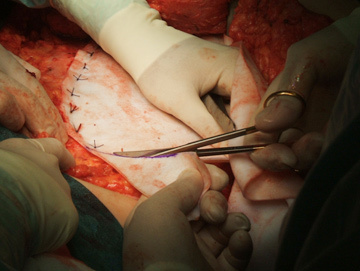 Place drains and close incision site using standard local hospital techniques and guidelines. Dispose of any unused EGIS® membrane sections following the applicable procedures of the facility and applicable environmental legislation. Note: Tension and arrangement of the sutures vary by application. A minimum overlap of 2-3 cm with healthy adjacent tissues is recommended.